​are available for pressure cleaning jobs large or small. 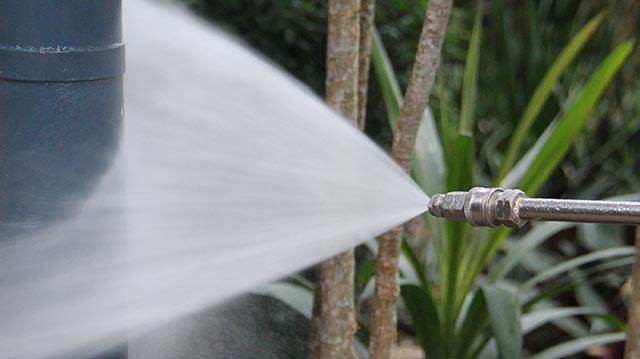 Why should I get my Byron Bay property pressure cleaned? Byron Bay is such a wonderful destination for our visitors and a wonderful place to live. Due to the geography and climate though, pressure cleaning in Byron Bay is an essential part of preventative maintenance for many home and business owners. All of Full Circle’s pressure cleaning in Byron Bay is fix-priced, giving the customer peace-of-mind as to the cost of each job. Pressure cleaning jobs in Byron Bay vary hugely, whether it’s pressure cleaning driveways, eves and gutters, washing a whole home, or commercial pressure cleaning of car parks, tennis courts or apartment blocks. Pressure cleaning in the Byron Shire, whilst being a chore to many, is something that with the correct pressure equipment, can be much more efficient and effective (not to mention much safer), depending on the task at hand. All roof and pressure cleaning services in Byron Bay are quoted for free and significant discounts are available for routine or annual cleaning. Oliver Hallock and the team are well known in Byron Bay for their quality roof and pressure cleaning, value for money and prompt, friendly service.